Manchester United manager Jose Mourinho has said midfielder Paul Pogba “never told me he wanted to leave”. 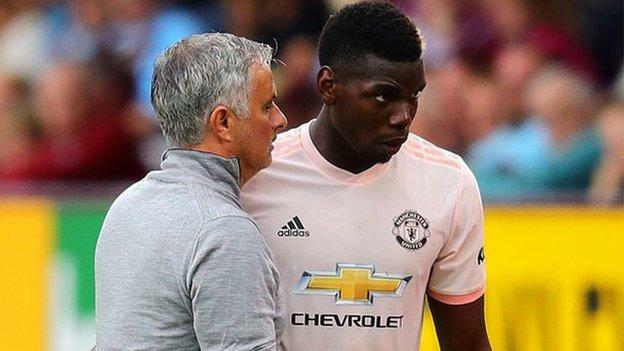 Pogba has cut a glum figure on his return to Manchester after France’s triumph at the World Cup, but Mourinho insists the midfielder “wants to stay”. “I can only comment on what is real for me, and not on what I read or what I listen to,” said the Portuguese. However, Pogba said he would be fined if he discussed his true feelings after the opening day victory over Leicester. The Frenchman fell out of favour at Old Trafford during an indifferent 2017-18 campaign for the 25-year-old. But following some inspired performances in Russia, including a goal in the World Cup final against Croatia, Pogba has been linked with a move to Barcelona this summer. However, Mourinho has since dismissed those comments, saying it is the “player’s problem and his relation with the media”.